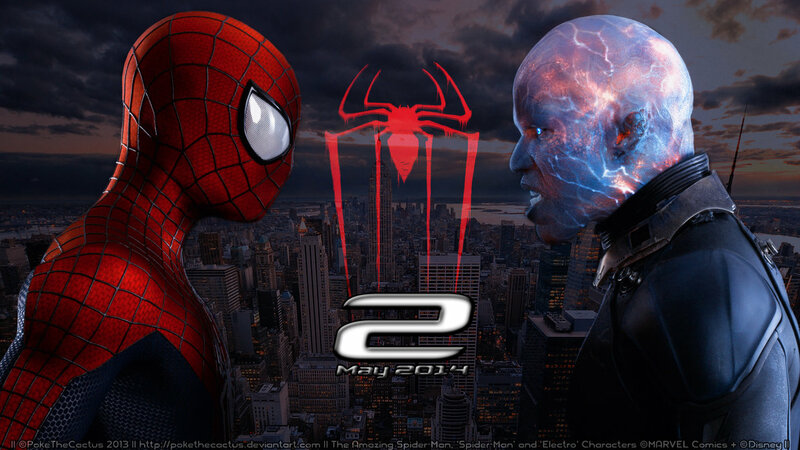 Box Office Reviews: THE AMAZING SPIDER-MAN 2: THE RISE OF ELECTRO- It’s saddening how much I enjoyed this. Despite being engaging and filled with fantastic music and action there is no getting past that Amazing Spider-Man 2 really isn’t a movie. It’s a gigantic plot setter for the next load of Amazing Spider-Man movies and lacks any plot or proper character development. Yet I still loved it and that my friends is the depressing part. Top Billed Cast: Andrew Garfield as Peter Parker/Spider-Man, Emma Stone as Gwen Cooper, Jaime Foxx as Max Dillon/Electro. When posters for the Amazing Spider-Man 2: Rise of Electro started to appear on the sides of busses and promo trailers began to feature at the beginning of YouTube videos early this year, I was skeptical. I have always loved the original Spider-Man trilogy with dear Tobey Maguire in the title role and wasn’t a big fan of the first ‘Amazing’ film. In fact I hated it. With a vengeance. However when I watched the sequel, ignoring my past biases, I was pleasantly surprised. In my opinion the movie was thoroughly enjoyable but hardly likely to go down in narrative history. It’s funny, with good action and more emotional engagement than you can poke a stick insect at. But it still feels a little… Stuffed. Although admirable, I still feel like trying introduce a number of new enemies and then have said enemies team up against spidey is just… Bad. It clutters up the film, rushes character development and can and has degraded what could be a great film to just a good one. The teaming up plot device didn’t work for Sam Raimi, Director of the original Spider-Man 3 and it doesn’t work here. Like part three of the original trilogy, the Amazing Spider-man 2 is a good movie but really it could have been great. Keep it simple stupid. Trying to explore all the different enemies and concepts and their individual development and sub-plots over crowds the film and means none of them really get the justice they deserve. Electro was compelling, not just as a villain but a character and it was right for him to have his name in the title. I find its just a shame he didn’t get more time on screen. All of Garfield’s Spider-Man, Stone’s Gwen and Foxx’s Max/Electro, deliver fulfilling, solid and compelling characters with good emotional engagement and some great dialogue. Although I personally believe that ASM2 is in the same boat as the current two Hobbit movies, that is, scenes that should be short are long and scenes that should be long are tiny or even non-existent. For example, Electro’s development from loving Spider-Man to “Let’s go catch a Spider” felt like a lot of character development and exposition was cut in between Max’s transformation into Electro and the Times Square scene. The Beautiful Romance of Peter Parker and Gwen Stacey, largely powered (I would imagine) from the actors’ real life relationship. The person who sticks out like a sore thumb in this mix however is Harry Osbourn (I prefered the Character as played by James Franko but Dane DeHaan carries it quite well. As for why they changed the name from Osborne to Osborn, who knows?). Dear Harry is a nice mix into the story but in their rush to set up his ascension (or descent) into villain-hood marvel’s writers have cut short both his usefulness to the story as Peter’s friend and in the sub-plot of him fighting to control his father’s company as well as shutting down all potential for character development. Now there is only one path for Harry in the next Amazing Spiderman movie: Provide information of Peter Parker being Spider-Man’s real identity to the major villain for that movie (who will probably be undercut in character development as well due to Harry’s inclusion) and then to be defeated and possibly even killed by Peter in an emotional scene. There is little room left now for the character to grow or be anything more than a villain who hates Spider-Man for X reason and having no potential for character growth is never a good thing. Despite all this I actually really liked the Amazing Spider-Man 2. Don’t get me wrong. I love this film. I’ve seen it three times and still think its pretty good. The movie is well executed and the interplay between Garfield and Stone as Peter Parker and Gwen Stacy is the highlight of the film, making Gwen’s death even more shocking and tragically beautiful. But it could have been better. So much better and this seems to be some kind of trend lately with a lot of movies. To be honest its just saddening. As much as I enjoyed this movie I am not looking forward to the next one. The romance between Garfield’s Spiderman and Stone’s Gwen and the story of Jaime Foxx’s Electro were the highlights of this movie and both things that sadly won’t be present in the next. The Amazing Spiderman 2 has some wonderful visuals that make the movie a pleasure to watch. Although there’s nothing new about the scenes of Spidey swinging through New York, the battle scenes with Electro are another thing entirely, amazing and beautiful in their execution. And I must say the ‘Bullet Time’ style scene where spiderman saves everyone on the red fluro stand in times square is fantastic. The music of the film is fantastic as Hanz Zimmer teams up with a number of well known singers and electronic artists to form the Magnificent Six (Pharrell Williams, Johnny Marr, Michael Einziger, David A. Stewart and Alicia Keys). Together the six Zimmer produces a vibrant and energetic soundtrack that really, I feel is one of the major reasons the movie is so very good despite its flaws. Tracks like Electro’s theme, mixing dubstep and electronica with orchestral and vocal music are just sheer works of art not to mention Spider-Man’s own theme, which evolves throughout the movie, changing with Peter Parker. One of the Amazing Spiderman 2’s highlights, the cinematography of this movie is fantastic. It is well planned and the direction is fantastic. Each scene is so flawlessly devised and filmed that the movie is a visual feast. So really, despite its rather major flaws I still really enjoy this movie but am saddened by its wasted potential. ← Photography, Life, Love and the Nature of Work. A comprehensive and genuine review. As always, I thoroughly enjoyed it !